Xamax Backrest (Executive) is scientifically designed & ergonomically crafted, the backrest covers the complete lumbar region, corrects the sitting posture and prevents backache. 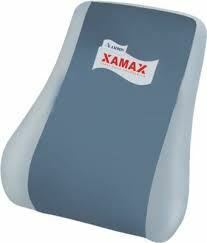 Xamax Backrest improves sitting posture & relieves strained back while driving. Features of Xamax Backrest (Executive): Makes Every Seat Ergonomic Scientific Design Long Lasting Resilience Adjustable Belt with D-hooks Available In Two Colors Washable Cover Universal size Place the backrest on the seat and tie the backrest with help of the adjustable belt and its ready to use. Manufacturer: Xamax Ergonomics Pvt. Ltd.